OAKLAND, Calif. (KGO) — A project nearly three decades in the making is officially underway in Oakland, a city facing a serious housing crunch. Nearly 1,000 new homes will be built at the site of the old Oak Knoll Naval Hospital, a facility that was closed in the mid-1990’s. 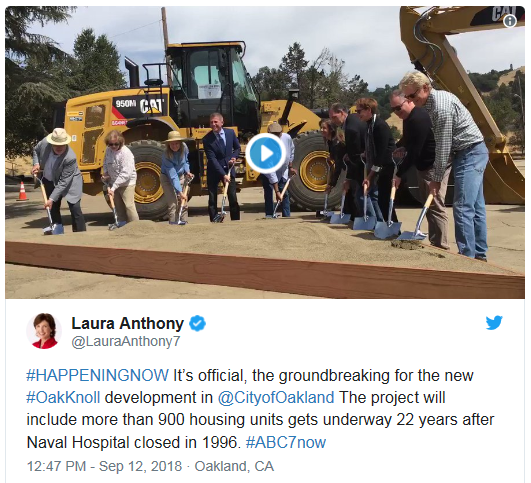 More than two decades after it shuttered its doors, shovels mark a new beginning for the Oakland Hills property that was once home to the Oak Knoll Naval Hospital. “We all remember when the hospital was imploded, but that was years ago,” Mayor Libby Schaaf said. That happened seven years ago in fact, and not much has happened on the property since then, until now. The new Oak Knoll will include 918 new homes, 80,000 square feet of retail, and walking trails and parks that will be accessible to the entire community. “This city, this neighborhood, has been waiting to see this incredibly valuable land put into good use and what better use right now than housing,” Schaaf said. The city of Oakland owns 5 acres adjacent to the project, which will be used to create affordable housing, paid for with $20 million in impact fees from the developer. “A developer has to come in that we select through the RFP process and tell us how many units he or she can build on those five acres,” Oakland City councilmember Larry Reid said. Oak Knoll’s development has not been without controversy over the years, but now that the actual work is underway, it seems most neighbors are on board with what will take shape here over the next decade. “I’ve got neighbors that have lived here since the 60s, so I think most neighbors are glad to see something being done with this land,” neighbor Mary Forte said.